Gladding-Hearn Shipbuilding, Duclos Corporation, has delivered the first of six Chesapeake Class pilot boats for coastal and offshore patrol operations and port security, provided by the Colombian Department of the Navy. Designed by C. Raymond Hunt & Associates, the all-aluminum deep-V hull measures 56.6 ft. overall, with a 17.8-ft. beam and 3-ft. draft and has a top speed of 27 knots. The launch is powered by twin MAN R6-800CRM diesel engines, each delivering 800 Bhp at 2,300 rpm. The engines turn Ultra Jet UJ-452 water jets through ZF 360 gears. The boat is equipped with a 16kW Alaska Diesel genset. At the transom is a winch-operated, rotating davit over the water-level recessed platform for rescue operations. Interior accommodations include six bunks, a head and full galley, air conditioning, and Llebroc seats and an upholstered settee in the pilothouse. 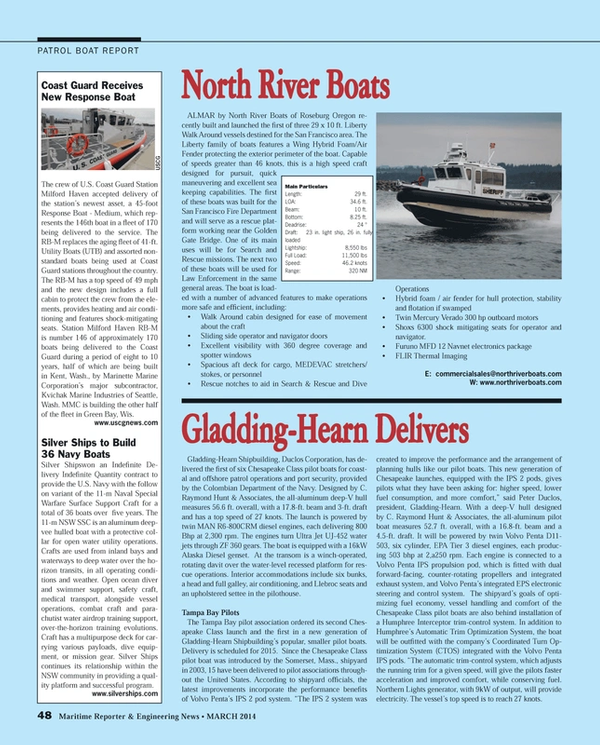 The Tampa Bay pilot association ordered its second Chesapeake Class launch and the first in a new generation of Gladding-Hearn Shipbuilding’s popular, smaller pilot boats. Delivery is scheduled for 2015. Since the Chesapeake Class pilot boat was introduced by the Somerset, Mass., shipyard in 2003, 15 have been delivered to pilot associations throughout the United States. According to shipyard officials, the latest improvements incorporate the performance benefits of Volvo Penta’s IPS 2 pod system. “The IPS 2 system was created to improve the performance and the arrangement of planning hulls like our pilot boats. This new generation of Chesapeake launches, equipped with the IPS 2 pods, gives pilots what they have been asking for: higher speed, lower fuel consumption, and more comfort,” said Peter Duclos, president, Gladding-Hearn. With a deep-V hull designed by C. Raymond Hunt & Associates, the all-aluminum pilot boat measures 52.7 ft. overall, with a 16.8-ft. beam and a 4.5-ft. draft. It will be powered by twin Volvo Penta D11-503, six cylinder, EPA Tier 3 diesel engines, each producing 503 bhp at 2,a250 rpm. Each engine is connected to a Volvo Penta IPS propulsion pod, which is fitted with dual forward-facing, counter-rotating propellers and integrated exhaust system, and Volvo Penta’s integrated EPS electronic steering and control system. The shipyard’s goals of optimizing fuel economy, vessel handling and comfort of the Chesapeake Class pilot boats are also behind installation of a Humphree Interceptor trim-control system. In addition to Humphree’s Automatic Trim Optimization System, the boat will be outfitted with the company’s Coordinated Turn Optimization System (CTOS) integrated with the Volvo Penta IPS pods. “The automatic trim-control system, which adjusts the running trim for a given speed, will give the pilots faster acceleration and improved comfort, while conserving fuel. Northern Lights generator, with 9kW of output, will provide electricity. The vessel’s top speed is to reach 27 knots.